Stockholm - November 15, 2016 - Pestana CR7, a lifestyle hotel brand from Pestana Hotel Group, is enhancing guest experiences at its newest locations in Lisboa and Funchal, with the implementation of ASSA ABLOY Hospitality Mobile Access. Maximizing efficiency for its guests, both hotel locations are adapting to the industry's demand for faster, more streamlined processes that can be accessed via guests' personal smart devices. In conjunction with the installation of ASSA ABLOY Hospitality's VingCard Signature RFID door locks, ASSA ABLOY Hospitality Mobile Access supplies unprecedented security and unparalleled convenience. With guests' expectations for faster, simpler service and mobile-compatible options continuing to increase, ASSA ABLOY Hospitality offers solutions that suit guests' mobile-oriented lifestyles and keep hoteliers at the forefront of industry trends. To meet these rapidly evolving guest demands, the Pestana CR7 Lifestyle Hotels management chose to implement several ASSA ABLOY Hospitality solutions at both of its new locations. "The Pestana CR7 Lisboa and Pestana CR7 Funchal are two of our newest properties, having recently opened over the summer, so we wanted to ensure that we implemented the most cutting edge technologies that are in line with the look and feel of our hotel designs," said Diogo Tamen, Technical Services, Maintenance and Conservation at Pestana Hotel Group. "We chose ASSA ABLOY Hospitality's Mobile Access and other innovative solutions because we are confident that these technologies will satisfy our guests' need for quicker access and the latest in hotel technologies, without sacrificing our ability to provide the most advanced security for them." is securely delivered to a guest's smartphone. The smartphone places the key in a secure digital key vault within the mobile app. When presented to the appropriate lock, the app then transmits the encrypted key over a secure communication channel using the device's integrated Bluetooth. This protocol ensures that only those users with authorized access to a specific guestroom are able to receive digital key information and unlock the room. The VingCard Signature RFID door locks also offer state-of-the-art security technologies with powerful and innovative anti-cloning features that prevent unauthorized access to a room, as well as unauthorized duplication of keycards. In addition, Pestana CR7 Lifestyle Hotels has implemented the VingCard Remote Controller, a device compatible with the electronic locking system that allows access control on common doors, such as guest entrances, health clubs and conference suites. 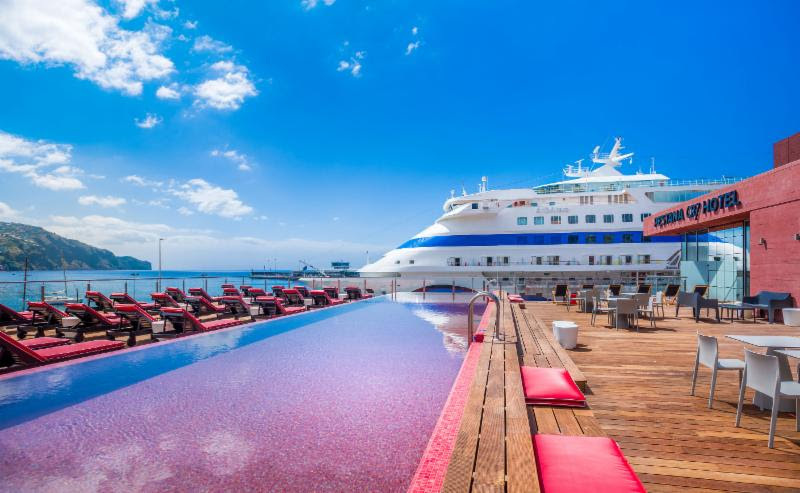 The two hotels are also using the Elsafe Zenith in-room electronic safes and PolarBar minibars in each of the 86 guestrooms at the Lisboa property and the 49 guestrooms at the Funchal property. For more information on ASSA ABLOY Hospitality Mobile Access and other ASSA ABLOY Hospitality products, please click here. More bar-code and RFID news can be found here. Subscribe to The Bar Code News - use left side menu link above - get the news automatically each day, or once a week, or once a month. No spam - your privacy is respected. Need some barcode case studies ? Use the menu link on the left side above or the SOLUTIONS link on the top menu bar.